Shakespeare works in all languages and all settings. That is part of his genius. Akira Kurosawa took the plot of Macbeth, transporting it to feudal Japan in Throne of Blood (original title Spider's Web Castle). With a powerful performance by its lead, Throne of Blood may be the best cinematic Macbeth of all time. General Washizu (Toshiro Mifune) and his compatriot Miki (Minoru Chiaki) are returning from having put down an uprising against the Great Lord. As they go through the Spider Web Forest, they come upon a spirit who makes predictions to them: that Washizu shall become the new Great Lord and ruler of the Spider's Web Castle, and that Miki's son shall inherit the throne after Washizu. Both men, loyal to the Great Lord, laugh this off as hallucinations. However, when the Great Lord grants them the titles and honors the spirit predicted they would receive, both men now begin to wonder. Washizu's ambitious wife Asaji (Isuzu Yamada) pushes her husband to kill the Great Lord and usurp the throne, but he wavers, especially given he has no heir. He has already agreed to make Miki's son his heir until Asaji tells her she is pregnant. Now Washizu finds himself in a quandary. He kills the Great Lord and takes Spider's Web Castle, then has Miki killed, feigning to invite him and his son to a feast to celebrate their successions. Miki's son, however, escaped the assassination attempt, and now the Great Lord's son and others have joined in a rebellion. Lady Asaji has a stillborn child, and is now insane, attempting to wash the imaginary blood off her hands. Washizu is not afraid, however, since Spider's Web Castle has never been taken. Moreover, in his hysteria he has returned to the Spider Web Forest, seeking out the spirit. The spirit tells him that he will not be defeated until the trees rise up against him. Deciding no such thing will ever occur, he is confident of victory. He shares this prophesy with his troops, who cheer on their leader. The next day, however, they begin to flee in terror, for they see the forest move against the castle. Washizu himself is stunned to see the forest appear to advance towards the castle. Chastising his troops, they at first are silent until an arrow flies at him from within the ranks. In turns enraged and terrified, Washizu attempts to avoid a barrage of arrows, with some managing to hit him. Finally felled, he falls, and Throne of Blood ends as it began: a mournful male choir singing of the folly of man. 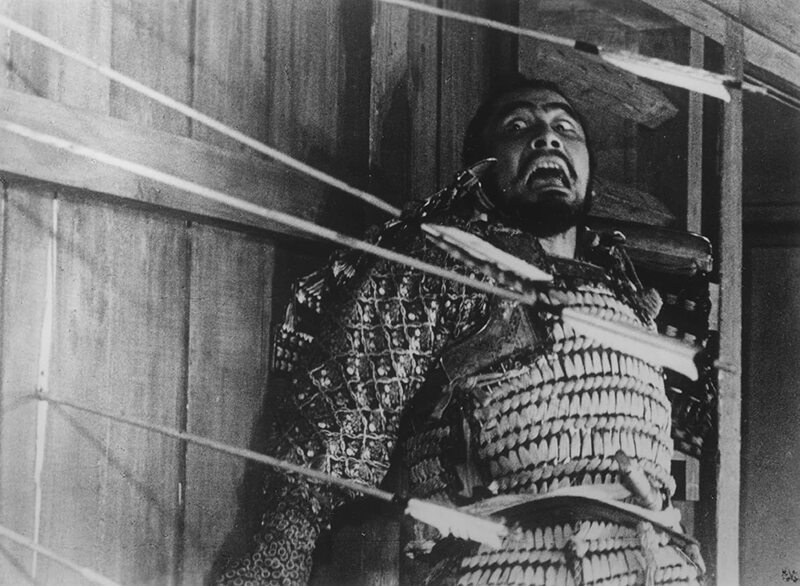 There are several elements that make Throne of Blood a rich, vibrant piece of art. One of them is the performances, particularly by Mifune. His Macbeth-Washizu is like an almost unhinged wild animal, fierce and dangerous. Whether he is raging or responding to his monstrous downfall, Mifune is a force of nature. The intensity of his performance makes Washizu into a compelling figure, frightening in its ferocity. You see in Mifune's face so much: tension, fear, shock, regret, devastation, arrogance, sometimes in the same scene. This is not a surprise given that Kurosawa crafted Throne of Blood to be close to the Japanese Noh theater style of acting, one where the face or masks in Noh are meant to express much. I can see why some people might find some of the acting perhaps exaggerated, but Kurosawa meant it to be a bit theatrical. To his credit, Mifune never came across as over-the-top and kept a strong balance between the traditions of Noh and a film acting manner. Kurosawa also brought a strong performance from Yamada as the Lady Macbeth-like Asaji. She is closer to Noh in that she is mostly very still and slow, but in her calm demeanor she displays the cold and calculating nature of this wicked lady. Another aspect that makes Throne of Blood a masterwork is in Asakazu Nakai's breathtaking cinematography. The Spider's Web Forest is extremely eerie, and the perpetual sense of gloom and foreboding is enhanced with the scenes set in fog and mist. In a curious way, they echo the Scottish Highlands that Macbeth is set in. If one studies Kurosawa's camera movements, you see an economic way to build suspense and surprise. For example, in the dinner scene the camera moves towards Washizu as he looks upon the empty mats where the doomed Miki and his son were to be at, then the camera moves back and we are all astonished to find the ghost of Miki sitting there. If there is a highlight of Throne of Blood, it is in the final scene of Washizu's execution by his troops. The barrage of arrows coming at him intensifies, with Mifune as a wild animal clawing desperately to escape his fate. The madness and fury of this, down to the final arrow that fells him, so shocks that it becomes a brutal but fascinating thing to see. Now, at this point, I think I may be reading too much into Throne of Blood or any symbolism it might have, but I think the film might be a critique of the rise and fall of dictators, perhaps with subtle commentary on Japan's wartime actions. I thought this when I saw Washizu's speech rallying his troops before the final battle. We see the great leader, drunk with power and arrogance, standing alone on his balcony, looking down over the faceless troops. He makes bold predictions, but when his predictions backfire on him, he faces his troops as an emperor without clothes, and is forced out in violence. I could not help think of people like Mussolini or Hitler or even Tojo, men who led their people into needless wars and in the end were brought down. In Mussolini's case, strung up by those who a few years earlier shouted 'Duce! Duce! ', and in all their cases, came to violent ends. Again, this might be just me reading too much into things, but that too is part of Kurosawa's genius: to allow for such interpretations. 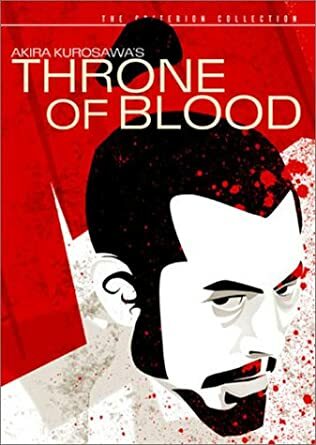 With breathtaking cinematography, a fast-moving story, and powerful performances particularly by Toshiro Mifune, Throne of Blood is a triumph. It is my favorite Macbeth interpretation so far, and I doubt it will be equaled, let alone surpassed.